The Glory of Kings is very involved and can be an expensive game in which to participate, both in terms of time and money. For God, King & Country was introduced many years ago as a roleplaying variant to allow players to take part as a single character rather than trying to run an entire nation or pirate brotherhood. It ran for a few years reasonably successfully but was then brought to an end. 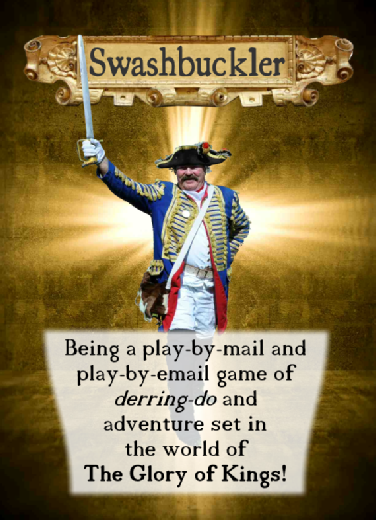 This brand new game, Swashbuckler, has the same basic premise. What then is that premise, I hear you cry? It's this: Swashbuckler runs within the game world of The Glory of Kings. That means the nations and larger organisations are run by the players of The Glory of Kings, while Swashbuckler players take part as a single character or person, someone further down the social scale with less power but still with a desire to make their mark in the world. The result is that Swashbuckler players can take part but their turns are cheaper, and also faster for them to deal with. So, Swashbuckler is designed to be quick to play and cheaper on your wallet - if you want more, then that’s what The Glory of Kings is for! Swashbuckler game turns cost £6 each, with one turn run per month. However you can purchase the rules without being under any obligation to take part.